The basic characteristics of the games are that players buy and sell shares in various companies and the player owning the most shares in a company controls its operations. Shares in the companies go up and down in value depending on the actions of the player director and also on the buying and selling of shares. 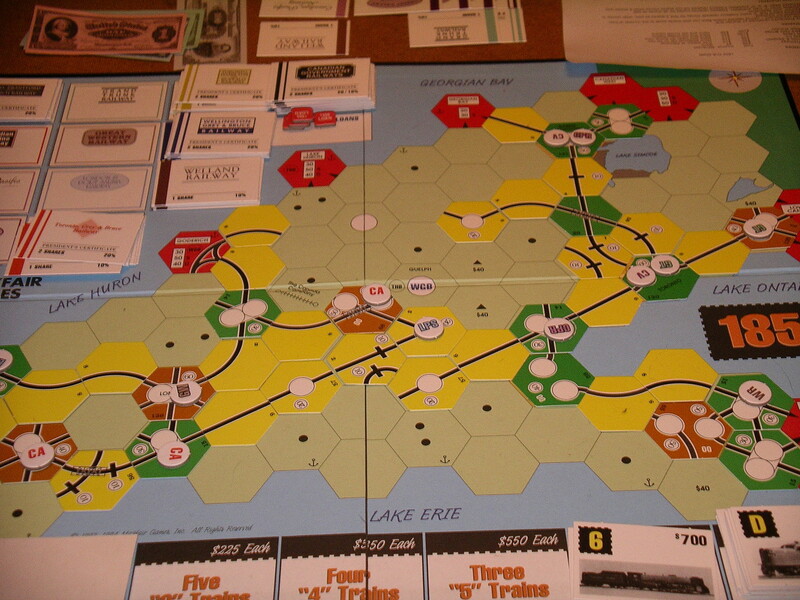 In most of the games, the companies are train companies and operations include the building of track by placing hexagons and the purchase of trains to run make money. Many of the games tend to run too long for play at the club, so those that have been played tend to be the shorter examples. Games that have been played include 1825, 18GA, Poseidon and Steam over Holland. "In the 20th Century, every region strives to develop and improve, each in its own way. Some become financial leaders. Others become centers of learning. Both science and commerce serve to propel nations toward the future â€“ but toward what kind of future? Growth produces waste, and the greatest advances may come with the greatest cost to the environment. How will these countries of the world mitigate the inevitable ecological catastrophes? Your goal is to improve the quality of life, creating a place where the environment is as healthy as the economy. Only then can you consider your region to be truly developed." - English Rules. "Lead one of the seven great cities of the Ancient world. Exploit the natural resources of your lands, take part in the eternal march of progress, develop your commercial relationships and assert your military might. Leave your mark in the history of civilization by building an architectural marvel that will transcend the ages to come. "- English rules.